Babblings of a Mommy: That's Not MY Grandma's Voice! That's Not MY Grandma's Voice! So you know those recordable storybooks that are out? I thought Hallmark was the only one who sold them so I was super excited when I found some at Target this morning! 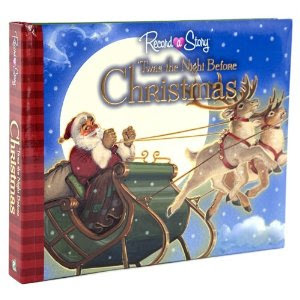 That is, until I opened Twas the Night Before Christmas (one my daughter's all time favorite books). Not only was the "To: and From:" already filled out with someone's name but they had also RECORDED THEIR VOICE ON IT ALREADY! I couldn't believe it! Are you serious?!! Someone changed their mind and returned it the store, but C'MON! You can't return a book once you've written on it and used it!! I just can't believe someone had the gall to return a book like that! Stopping from the Bloggy Moms Blog Hop! I can't believe someone did that. Why won't you erase it or give it to the person whose name is in the book. They wrote on it with pen! There's no way of erasing that. To be honest, I don't know how Target let them return it like that. The sales associate probably didn't do a good job of checking the book.